Iran's Nuclear Fatwa: A Policy Or A Ploy? Iran's supreme leader has repeatedly cited his own fatwa, or religious edict, that nuclear weapons are a sin and that Iran doesn't want them. Many in the West are skeptical, but U.S. officials are calling on Iran to live up to the fatwa. Iran's Nuclear Fatwa: A Policy Or A Ploy? 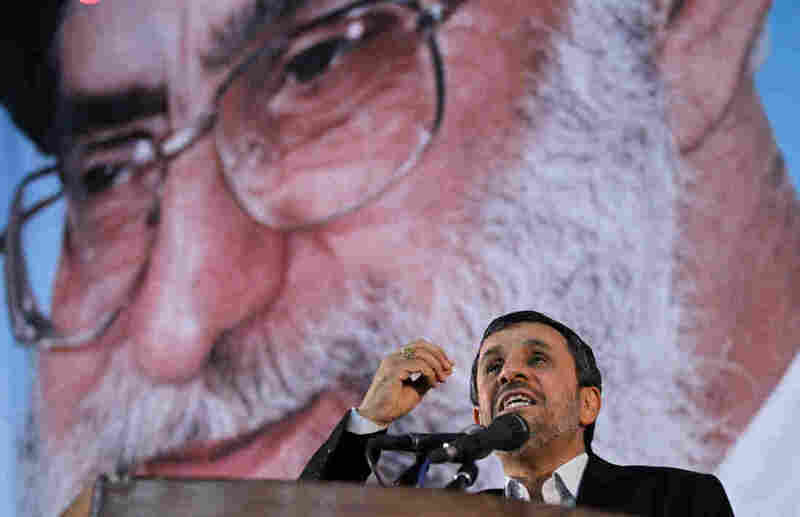 Iranian President Mahmoud Ahmadinejad delivers a speech under a portrait of Iran's supreme leader, Ayatollah Ali Khamenei, on June 2. The supreme leader has said repeatedly that nuclear weapons are un-Islamic and Iran will not pursue them. But in the West, many are skeptical. It's been an article of faith for nearly a decade that Iran's supreme leader issued a fatwa — a religious edict — that nuclear weapons are a sin and Iran has no intention of acquiring them. President Obama and Secretary of State Hillary Clinton recently made references to this religious commitment from Iran's leader, Ayatollah Ali Khamenei. But with the next round of nuclear talks scheduled to resume on Monday in Moscow, analysts point out that there are serious questions about the nature of the fatwa and whether it's as persuasive as the Iranians would like the world to think. As far as anyone knows, the fatwa was never written down. The first time Khamenei proclaimed that nuclear weapons were un-Islamic was in 2003. He has repeated this numerous times since them, notes Muhammad Sahimi, who writes for the website Tehran Bureau. Iranian foreign policy, specifically on the nuclear question, is not motivated by religious ideology but by reasons of state and by the desire of this regime to survive. "Khamenei has been consistently saying at least for the past seven or eight years that the production of nuclear weapons is against Islamic teaching and therefore Iran will never pursue such a path," Sahimi says. In the two rounds of international talks so far this year — Iran on one side, the U.S., Europe, Russia and China on the other — Iranian officials have argued that the fatwa should persuade the world that Iran has no intention of acquiring nuclear weapons. But this fatwa — or any fatwa — is not inscribed in stone, says Mehdi Khalaji of the Washington Institute on Near East Policy. "Fatwa is changeable by nature and the Shia theology gives this freedom to be flexible and go for the most updated interpretation and circumstances," Khalaji says. Iran's supreme leader understands, says Sahimi, that circumstances in the world are always changing and thus fatwas must face scrutiny. "Once it is issued, it doesn't imply that it can never be changed," he says. "The conditions can change and therefore a new fatwa can be issued that would basically nullify the previous one regarding the same issue." There are other concepts in Shiite Islam — lying to protect the life of Muslims or expediency to guard the interests of the state — that Iranian leaders could cite to reverse a fatwa. Both Obama and Clinton have made reference to the nuclear fatwa. Obama sent a verbal message to Iran's supreme leader earlier this year that acknowledged it, and Clinton mentioned it earlier this month. "They have also made it clear in many statements," Clinton said, "most recently in the fatwa that was issued by the supreme leader that they don't seek nuclear weapons, that they have no such program." Both Obama and Clinton were obviously trying to use the supreme leader's words to make progress at the bargaining table, which is a smart approach, according to Khalaji. "It's very wise for the administration to raise the political cost of producing a nuclear bomb," he says. In Khalaji's view, the Iranians' repeated references to the nuclear fatwa make it harder and harder for them to consider reversing course on the bomb. But Nader Hashemi, an Iran analyst at the University of Denver, cautions that the supreme leader is first and foremost a political leader, despite the influence of religion in Iran, even if the fatwa cites religion as the basis for its authority. "One of the problems here is this assumption that Iranian foreign policy is somehow driven, motivated and directed by a religious, ideological agenda," Hashemi says, "thus elevating the importance of this fatwa as a way of understanding the inner workings of the Iranian regime." Hashemi argues that just like all other political leaders around the world, the supreme leader's decisions and utterances are fundamentally political. "Iranian foreign policy, specifically on the nuclear question, is not motivated by religious ideology but by reasons of state and by the desire of this regime to survive," he says. Diplomats should keep that in mind, Hashemi says, when they sit across the table from the Iranians once more next week in Moscow.